Time for another monthly US electricity generation report. The general takeaway for those focused on our transition to renewable energy is that renewables were up to 14.8% of US electricity generation in November 2014, and 13.5% for the year through November. Unfortunately, that’s just a tad higher than the 13.2% they were at for January–November 2013. You may be wondering, “How could that be, when solar and wind power have grown so much?” The key reasons are: hydropower generation was down 11,502 gigawatt-hours (GWh), coal generation was up (19,603 GWh), nuclear generation was up (5,982 GWh), petroleum liquids generation was up (5,490 GWh), and natural gas generation was up (3,163 GWh). That almost offset wind generation being up 13,480 GWh, utility-scale solar PV being up 7,374 GWh, rooftop solar (estimated) being up 8,849 GWh, solar thermal being up 1,473 GWh, and wood generation being up 2,330 GWh. In 2014 through the end of November, utility-scale solar PV passed the 15,000 GWh marker, almost double the total for the same period in 2013 (7,636 GWh). With rooftop solar added in, solar PV is estimated to have already passed 30 GWh in 2014, but we need to wait another month for the EIA numbers and another year for NREL numbers. If our estimate is correct, solar power hit ~1% of US electricity generation in 2014, which sounds small, but is a big number when you look at how disruptive technologies grow. Within the general sector of “renewables,” the big dogs are still hydropower and wind power. They each provided approximately 40% of the electricity generated by renewables in November (80% combined). All forms of solar combined provided approximately 6%. While that figure is small, however, the biggest takeaway point from it for me is: the solar industry is going to explode in the coming years. Nothing compares to solar when it comes to energy potential, and the recent drop in costs combined with still-dropping costs mean that solar can beat other sources in more and more markets. Just look at the percentage of new electricity generation capacity that is coming from solar. 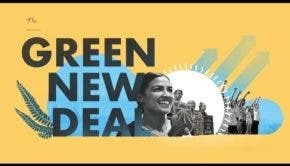 Furthermore, rather than simply beating or replacing large fossil fuel and nuclear power plants when a utility decides it needs more or new electricity sources, rooftop solar is a consumer product that could destroy the entire utility business model at the right price. Rooftop solar is here and growing, and I am convinced that the biggest barrier to much faster growth is simply consumer awareness. Whether that will still be an issue in 5 or 10 years is yet to be seen. 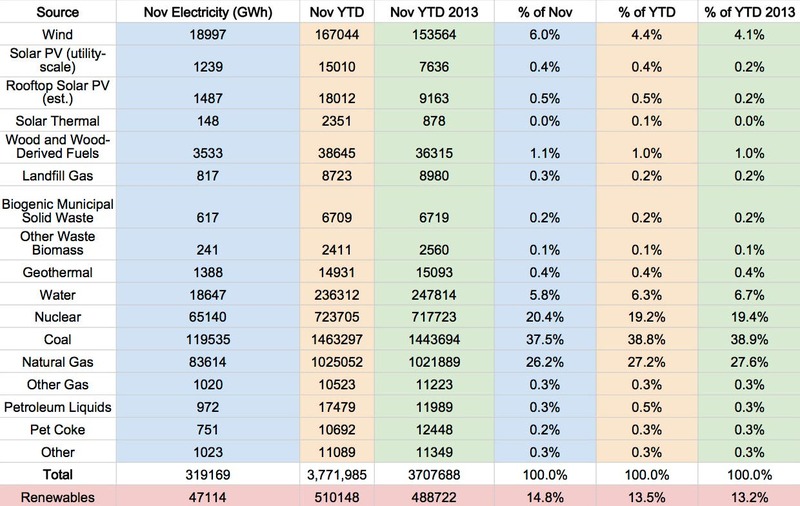 If you look at individual renewable sources compared to the entire electricity generation mix, wind = 6% in November and 4.4% for the year through November, which means it is getting up to a notable level, beating hydro for the month (which was 5.8%) but still a bit below it for the year through November (6.3%). Nuclear is still around 19%, coal is around 39%, and natural gas is around 27%. They are all generating a tremendous amount of electricity, and their generation even grew by a large amount in the past year. In other words, the story remains the same: without disruptive and exponential renewable energy growth, we are digging our own graves.